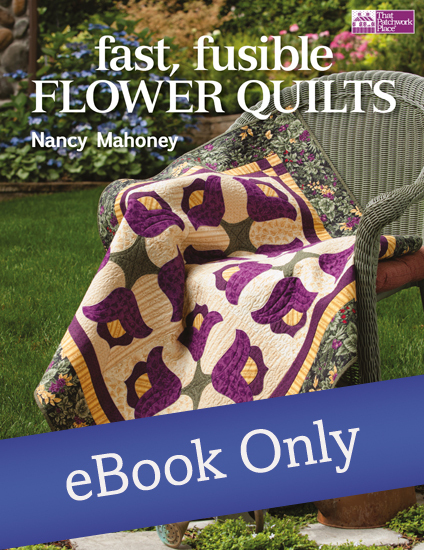 Best-selling author Nancy Mahoney presents a great collection of floral quilts featuring fusible applique. Quilters will be thrilled to find 11 beautiful, easy-to-make projects. 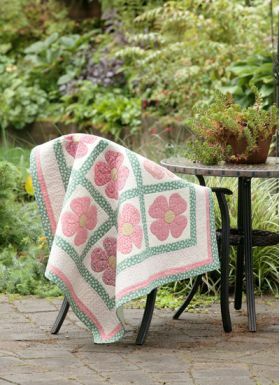 This book presents a collection of very pretty and simple flower quilts. Most, but not all, of the eleven projects combine both simple piecing and fusible web applique, but instructions are also included for freezer paper applique. The flower blocks use fairly simple shapes, but most of the projects feature recognisable yet stylized flowers, including dogwood roses, peonies and daisies. 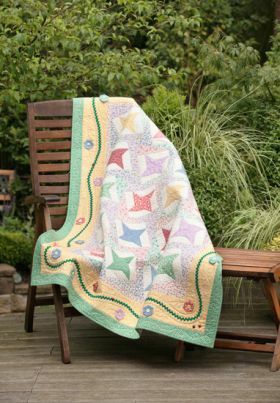 All the projects are within the grasp of a beginner quilter and range from wall hangings to single bed quilts, although you could easily add or remove blocks to change the size of your finished item. Some of the projects have been made up in thirties style fabrics, but all the designs are adaptable to your own taste. 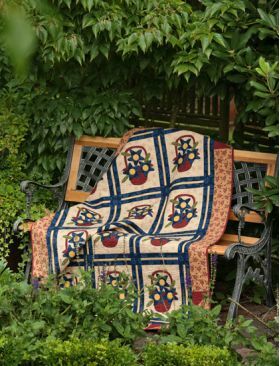 The quilting suggestions included in every project are lovely and there are also useful close-up photographs of the quilting designs. 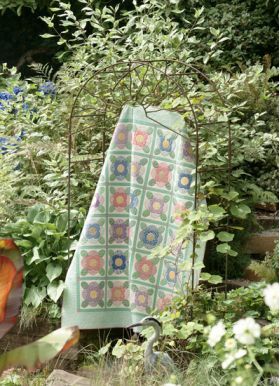 The applique patterns are all full size so you don't need to worry about enlarging any of them. 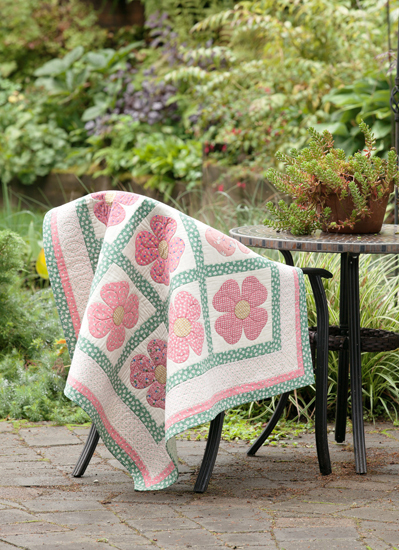 All in all, the quilts in this book are adaptable and easy to make projects. 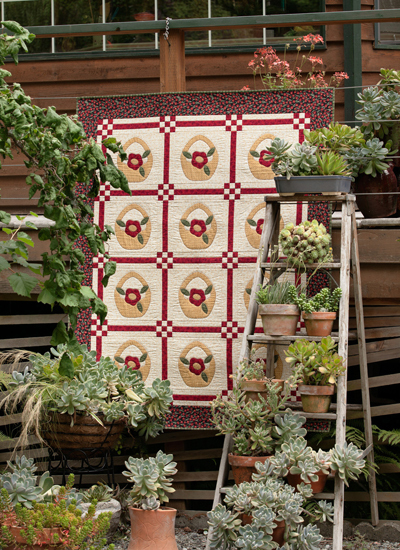 This wonderful must-have title features 11 quick and easy, no-fail garden quilts that will gladden the hearts of gardeners. This title is especially suitable for beginners. There are designs here to suit every taste and decor. 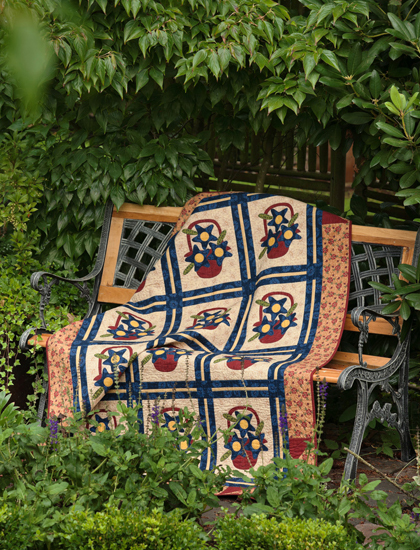 The projects include several twin bed quilts along with assorted, exquisite wall hangings and lap quilts. Among the flowers are some classics like the much loved amaryllis along with the all-time favorite—the daisy, dogwoods, and peonies. 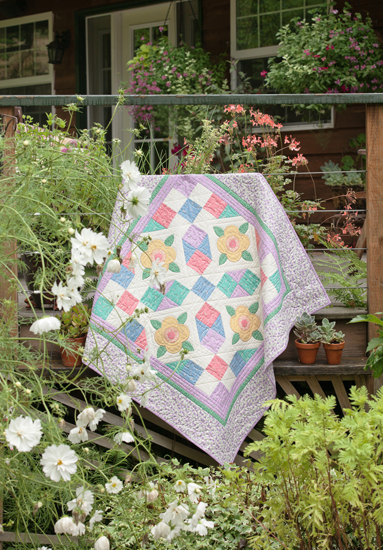 Some quilts depict beautiful baskets of flowers. 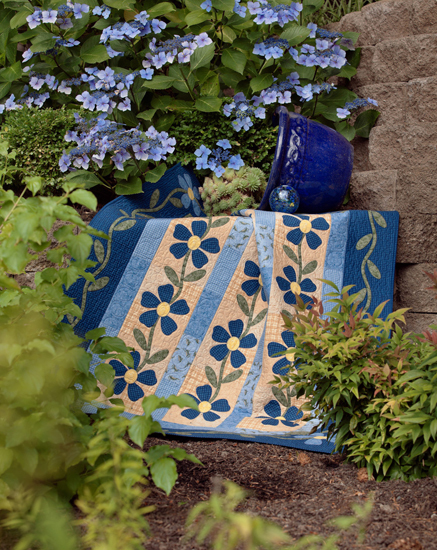 Gardeners can choose from assorted design options from stylized daisies to funky peonies and realistic, true to life blossoms. 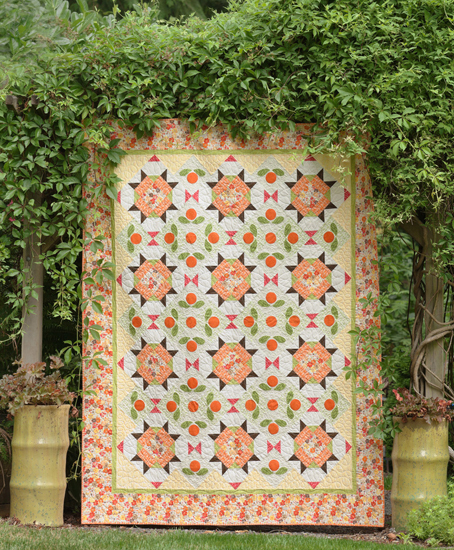 These projects combine easy pieced borders and the like with the gorgeous garden appliqués. All of the projects are so appealing that I find it hard to choose a favorite. 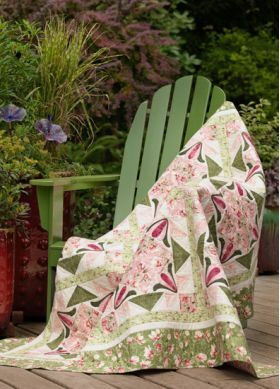 For each project this has a complete list of all the materials and supplies you’ll need, cutting instructions, color layouts, easy to follow, fool-proof, step by step directions from start to finish from doing the quilt blocks to completing the quilt. There are also ready to use templates for the appliqués. This also covers all of the basic appliqué, sewing, and quilting techniques. 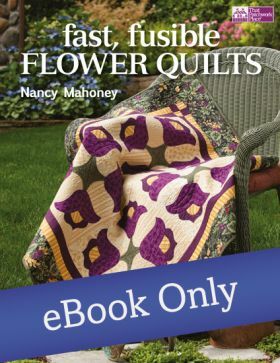 Well-known author, teacher, fabric designer and award-winning quilter Nancy Mahoney has released her 11th book with Martingale. 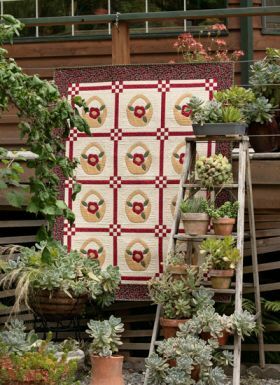 Inspired by memories of her own gardening and the vast selection of floral fabrics on the market, Nancy has created 11 easy-to-make, full-size block quilts, which can easily be adapted to a size of your choosing. 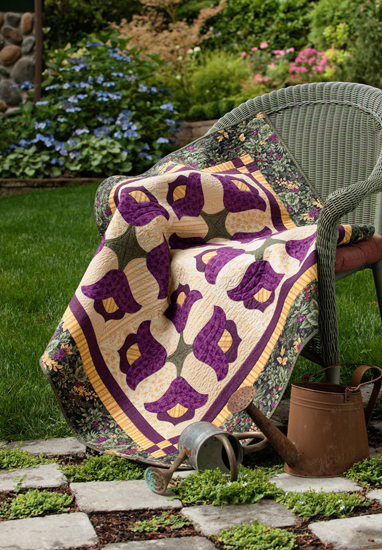 To simplify the applique, all but one quilt features fused floral segments, with fusible and quiltmaking instructions. The last includes folded flowers with patchwork blocks. I liked that the samples were both in bolds and 30s fabrics, offering a wider appeal. I particularly liked the bolder quilts, including Orange Marmalade, which includes a secondary pattern, as well as the clear-toned Precious Peonies, a favorite flower. 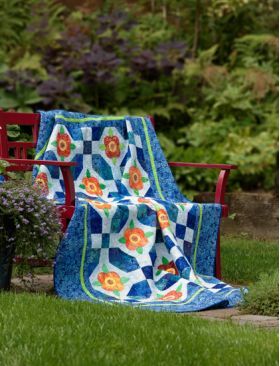 My favorite quilts in Fast, Fusible Flower Quilts are Night Blooms (batiks in amazing blues and oranges) and Amaryllis (see the front cover)—but there are half a dozen that could easily go on my “must make” list. I’m so excited about Amaryllis that I made a sample block in the fabrics I’m considering. 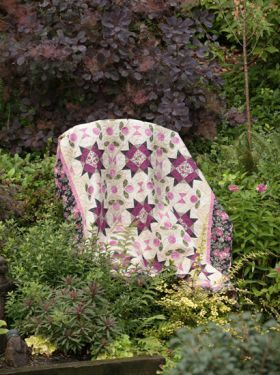 I believe one indicator of a great pattern is when a quilter can see the design and easily visualize it in fabrics different from those shown. 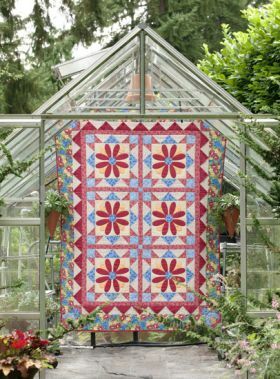 In fact, I can think of so many possibilities for Amaryllis, I might need to make this quilt several times.